Bok choy, also known as Pak choi or Peking cabbage, forms a small but elongated head (not round like European cabbage) with plump white stalks and deep green leaves. A member of the brassica family, bok choy offers nutritional assets similar to those of other cabbages: It is rich in Vitamin C and contains significant amounts of nitrogen compounds known as indoles, as well as fiber--both of which appear to lower the risk of various forms of cancer. 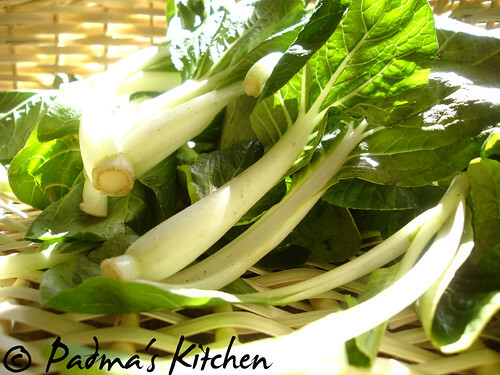 Bok choy is also a good source of folate (folic acid) and potassium. And with its deep green leaves, bok choy has more beta-carotene than other cabbages, and it also supplies considerably more calcium. The stalks and leaves have quite different textures, so in culinary terms, it's like getting two vegetables for the price of one.Baby bok choy has a sweeter flavor than adult varieties. For more information on varieties, availability, storage and nutritional information click here, here, and here. 1 cup of cooked bok choi contains 15% of your recommended daily allowance of calcium ~ equivalent to 1/4 pint of full fat milk. I like adding baby bok choy in salads, stir fry's, soups, stir-fry noodles and fried rice and recently thought why not make some dal ~ pappu out of it. That way we can have our fiber intake as well as some folate too. Its a nice cross-over for leafy vegetable dal. Chop coarsely bok choy and pressure cook them with toor dal/lentils along with turmeric powder, onions, green chillies, cumin seeds and chilli powder. Cook upto 3-4 whistles. Add tamarind pulp, salt to it and mash the contents. In a deep pan heat oil, add mustard seeds, let it splutter then add urad dal/black gram lentil, curry leaves, torn red chillies, garlic and fry for a min. Add hing/asafeotida and pour the entire mashed bok choy dal and mix well. Let it simmer for 2 more mins. 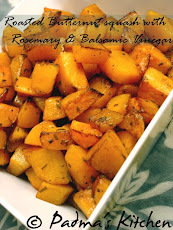 Serve hot with plain rice or rotis /Indian flat bread. Note: Use of salt should be limited while cooking this dal as bok choy already is little salty in nature. Thats what I found out while cooking with it. Padma, what a neat idea. Bok Choy in daal is a new idea for me. Also I have never tried putting tomato to cook along with daal. Got to try this new idea. 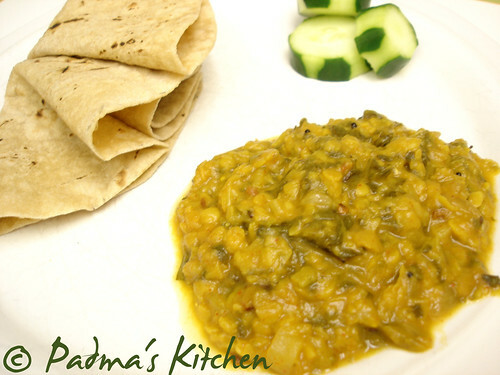 haven't heard of this bok choy.its name might be different here..
padma..that is a great idea...dal looks yummy! I've seen this veggie in chinese markets but never knew what to do. This is a really cool idea. will try it for sure. 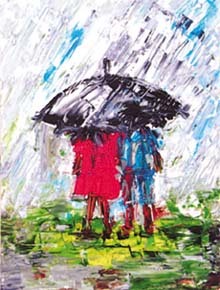 Nice picture. good info on baby bok. i haven't tried it so far.Next trip for grocery i will look out for baby bok.Must have been nice with roti, right? Thankyou for this wonderful recipe,using Bok choy..I never hav cooked this veg b4,but I will give this a try...!Thanx for the idea.! nice recipe, padma! thanks for the information. in Bangalore they call it chinese cabbage. but i never knew what to do with it! Hey that is a very clever idea adding the bokchoy to the dal. I hacve never ever thought about doing it. hey, u've made using bok choy so easy to do, that too in a cooker, fantastic! i see it still retains it's texture, right? i'm surely going to try it. Hey Redchillies! thanks for your kind comments ya! But I did not add tomato to it, I avoid cooking tomatoes with cabbage and spinach..
Hey BBO, nice to see u here. Tx for visiting! hey Padma, nice info. I have to try it. Does it taste like other regular dals? Hey padma, how does bok choy taste. I never cooked with it before. Great job putting these two together... I haven't tried cooking with bokchoy but this recipe of yours makes me want to. Looks great and healthy as well. Remys, thanks for visiting, nice to see u here. Meg, great to see you here, so you are also a Bok choy lover! I've never put those two together before, but I can't wait to try it now. YUM! Wow! What a beautiful dish, and your way of explaining is so precise, right down to the timing of the recipe, lovely! I use bok choy a lot but never tried in Indian dishes. Pappu sounds interesting. Will try it next time. Bok Choy.......Hmmmm should give a try. Nice idea.